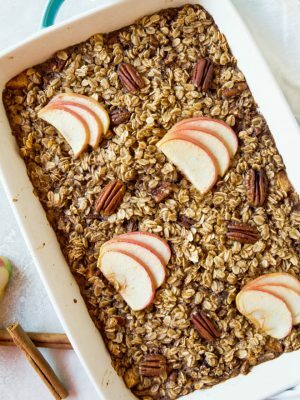 Apple Cinnamon Pecan Baked Oatmeal is the best way to start the day! Preheat the oven to 325°F. Grease a 9-inch baking dish with butter; set aside. In a medium bowl, combine the oats, ½ cup pecans, baking powder, 2 teaspoons cinnamon, nutmeg, and salt. Mix well. In another bowl, break up the eggs with a whisk; then whisk in the milk, maple syrup, and vanilla until well combined. Add the milk mixture to the oat mixture, along with the melted butter. Stir well to combine. Combine the diced apples and remaining pecans in a bowl. Toss with the remaining cinnamon, then scatter the apples evenly on the bottom of the prepared baking dish. Pour the oatmeal mixture over top and spread evenly. Garnish top with thinly sliced apples if desired. Bake for 40-45 minutes, until the top is golden and the oats are set. Serve warm or at room temperature. Freezer-Friendly Instructions: This dish can be frozen after baking, tightly covered, for up to 3 months. When you’re ready to serve it, defrost in the refrigerator for 24 hours then reheat it, covered with foil, in a 325°F oven until hot.